The Sunshine Coast Trail isCanada’s longest hut-to-hut hiking trail. At 180 km, the trail covers everything from low lying, coastal hiking on up to higher peaks. The Mount Troubridge section of the trail is accessible by car via a logging road, or you can tie it in to a longer hike within the Sunshine Coast Trail. Should you want to make a multi-day trip out of it, try starting at the Saltery Bay Ferry Terminal and following our directions to the Fairview Bay Hut and Rainy Day Lake. You can then continue on to Mount Troubridge. Drive South on Highway 101 until you reach the Saltery Bay Ferry Terminal, but turn left at the stop sign immediately before the ferry booth. This road will bring you to the SCT kiosk and the trailhead for Fairview Bay on your right, or will continue on as an uphill gravel road towards Rainy Day Lake on your left. You can start the hike here and spend a night at the Rainy Day Lake Cabin before continuing up to Troubridge in the morning (see Rainy Day Lake hiking directions), or if you have a 4×4 vehicle you can drive up to Rainy Day Lake and start the Troubridge hike from there. Park at the 4×4 access to Rainy Day Lake (the second entrance, where the sign says “Rainy Day Lake 1.8km”), and then keep walking up the logging road for a few hundred meters. You will see the trail access for Mount Troubridge (Sunshine Coast Trail – North) on your LEFT. Leaving the cabin, take a LEFT in the fork in the road and follow the Sunshine Coast Trail North. Hike for 1.8 km until you come to a logging road, and then turn RIGHT. In a few hundred meters you will see the trail access for Mount Troubridge (Sunshine Coast Trail – North) on your LEFT. This trail will continue on for a few kilometers until you come to a power line and a beautiful view of Jervis Inlet and Nelson Island. Turn LEFT on the logging road here. You will quickly come to a fork in the road- take the path going up on the RIGHT (there is a post marked SCT here) and look for a rocky road leading back into the trees on your LEFT (there is a very visible “Mount Troubridge” sign that you can see from the gravel, but finding the path is a little more tricky). The path will be a little overgrown here for about kilometer, but then it starts to clear up. Follow the orange squares for the rest of the path until you reach the summit just before km 159 and an amazing log cabin beside Jocelyn Pond just after km 158. 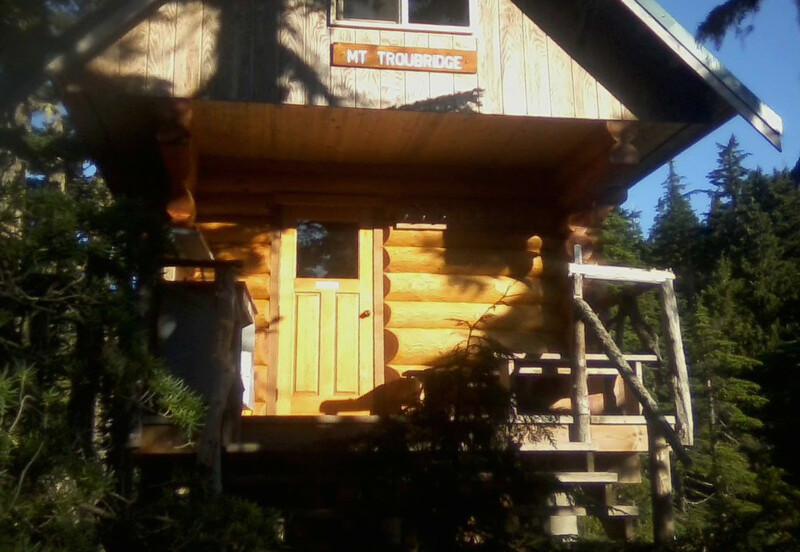 Troubridge is the highest point on the SCT, so you’ll feel very accomplished at the top! The old emergency shelter at the summit isn’t the cabin- don’t worry when you see it!